Mick the Miller was born in June 1926 in Ireland. 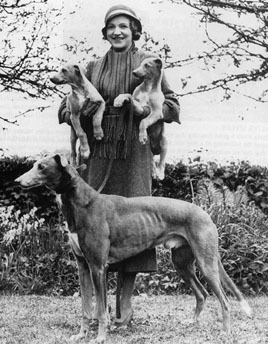 He was one of a litter of 12 bred by the Parish Priest and lived the usual life of a young greyhound. However just before his first birthday he was struck down by distemper, a highly contagious and potentially fatal viral disease which primary affects dogs. There were no vaccines back in the 1920s and his chances of survival were slim. However, Father Brophy, who had reared him through thick and thin, refused to accept defeat and took the dog to Arthur Callanan, who was the manager of the Shelbourne Park Greyhound Track in Ireland at the time as well as being a qualified vet. Mick The Miller was frail but Callanan thought there may be a chance of saving him and asked Father Brophy to leave the ailing dog with him. He was saved after days and nights were spent in caring for the pup, he was then returned to the Priest after several months with the advice to give the dog a lengthy spell convalescing. It was not until April 1928 that a now near two-year-old Mick The Miller made his racing debut. He won with ease and went on to compete in a total of 20 races in Ireland, winning fifteen of them and gaining himself a hefty reputation in the process. One of his litter-bothers, Macoma, was also to prove himself as one of the all time greats over hurdles. Trainer Mick Horan knew he had a real racing machine on his hands and advised Father Brophy to have a crack at the English Derby. In May 1929 they came to England with Mick The Miller. His first trial at White City was a sensation and he was almost immediately put in as favourite to win the Derby, which, in those days, was restricted to 48 runners and decided over four races. There was a clamour to buy Mick the Miller immediately after the trial and Father Brophy decided there and then to auction his star on the terrace steps. He was duly sold for 800 guineas to a London bookmaker. A huge amount for a greyhound in the 1920�s. Word soon spread and he attracted a huge audience for his first race, which was the first round of the 1929 Derby and not only did he win, he smashed through the then unachievable 30 second barrier for the 525 yard strip at White City. He flew though second round and semi-finals with impressive successes and was naturally a hot favourite to land the �700 decider. He was beaten into second by Palatinus but the Gods were on his side and it was declared a no-race. He found his best form again in the re-run just half an hour later and, this time, beat Palatinus by three lengths in 29.96sec. He was, by now, something of a celebrity and was in action again just days after the first of many famous victories in Britain. The dog took up residence at the kennels of Sidney Orton, who was based at Wimbledon as Father Brophy and Mick Horan went back to Ireland considerably richer. Stepping up to 600 yards at the giant track at West Ham, he trounced his rivals by seven lengths in his heat early in the afternoon and, on the evening of the same day, took the �200 final by four lengths. He won over �1,200 in prize money in various events and match races before changing hands again for an unprecedented 2,000 guineas. 1930 proved another vintage year for Mick The Miller, winning countless races and taking the Derby again that year, going through the event as he did the previous year, with an unblemished record. A hectic schedule followed with unbeaten runs through the Cesarewitch at West Ham and the Welsh Derby at Cardiff during July. So much racing eventually took its toll and he was eliminated in the first round of the Laurels at Wimbledon the next month. A lengthy rest followed and Mick The Miller was not seen in action again until the spring of 1931where he went unbeaten through the Spring Cup at Wembley. He was then lightly raced in preparation for his third Derby attempt. Clearly beginning to feel the effects of a lengthy campaign, he had to settle for second best in the three runs leading up to the final. Come the big night, trainer Orton had his charge spot on and he ran the race of his life to land his third successive Derby. But, just as he had landed his first title, the race was cruelly taken away from him with another no-race decision. The re-run was less than an hour after the first 'race' and Mick The Miller's old legs were simply too tired to carry it off again and he was soundly beaten into fourth by Seldom Led, who had finished last in the original final. It was the twilight of Mick The Miller's career on the track but he still had a treat to serve up for his legion of fans. Well over five years old, he was entered for the St Leger at Wembley and duly went through the event unbeaten. Greyhound speeds have increased since the dawn of track racing in the 1920s and 1930s and Mick the Miller's records have long since been broken; however, he is still considered one of the greats because of his spirit and because the excitement surrounding his achievements helped popularise Greyhound racing in England. Many greyhound racing stadiums still have facilities named after him.